Our Spring Luncheon was held at the Sturgeon Bay Yacht Club on Sunday, May 20, 2012. The food was wonderful and a good time was had by all who were able to attend. A special 'Thank you' goes out to Jackie Ritchie for planning this event. Prior to the meeting the EHYC Board of Directors met to finalize our 2012 summer events. 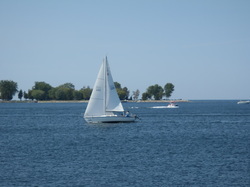 1.Saturday morning sailboat races began on June 16th at 9:00 a.m. and will be held each Saturday morning through August 25, 2012. 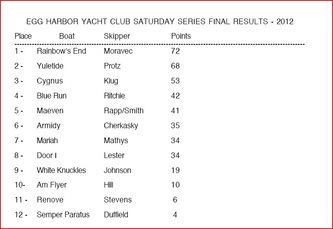 Should you wish more information about these races, please contact Commodore Jim Rapp at jimjelenko@comcast.net . 2. The dates for our 'Third Saturday Gatherings' are June 16, July 21, August 18, and September 15 at 4 p.m. Members usually bring their own beverages and a snack. 4. 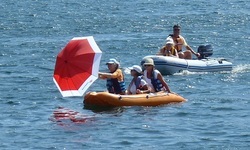 Our 'Mary Poppins' Umbrella Race (dinghy/kayak) was held on Saturday, July 21 at 2:30 p.m. Volunteers for this event were: Dan & Penny Niesen, assisted by Mike Stapleton. At 4:00 p.m. we held our July 3rd Saturday Gathering. Volunteers were Denise Ostrander, Mike & Pam Plamann, and Bill & S andy Ward. 5. On August 18th we held our second annual 'Poker Run' followed by our third Saturday Gathering. Volunteers and participants alike enjoyed a beautiful day. Check out the pictures! T.C. Johnson and a great group of volunteers made this event a success. 6. 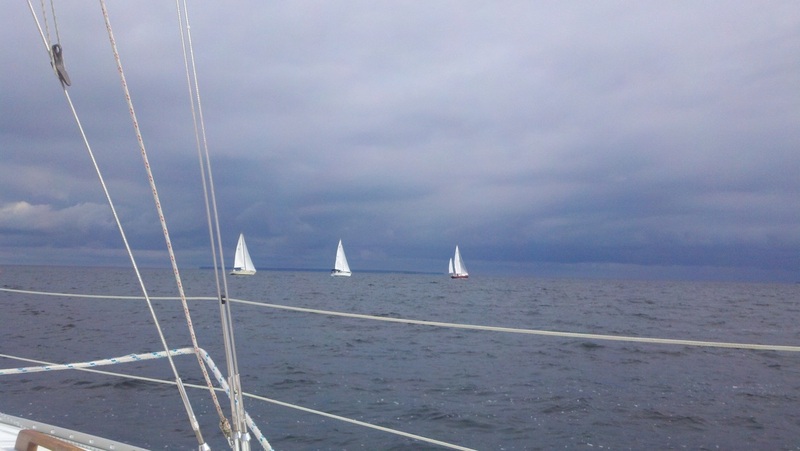 On August 25th at we held our first 'Small Sailboat Regatta.' Volunteer for this event was Bill Freyman, with the help of Mike Stapleton. A thanks goes out to all those who volunteered both on the water and on shore to make this event a success. Family Race followed by the EHYC Annual picnic. Volunteers were: Karl & Lucy Klug, Sue & Jack Wittemore, Florri McMillan. Jim & Barb Lester. Mojo Rosa's catered this event. Thanks also to all the Marinette racers who were able to enjoy the day with our club. 9. Our final 3rd Saturday Gathering was held on Saturday, September 15th. 10. On October 14, 2012, we held our final social of the year at Horeshoe Bay. Our Fall Gathering and Luncheon was a fun and relaxing way to recap and end the 2012 Season. Our Fall Luncheon and Annual Meeting was held on Sunday, October 14, 2012. The buffet luncheon provided by Horseshoe Bay was delicious and members enjoyed a wonderful 'end-of-the season' gathering. Andy DeMille (new), Mary Dunworth, T.C. Johnson, and Marty Moravec. Members voted to accept the nominations. Congratulations to all! 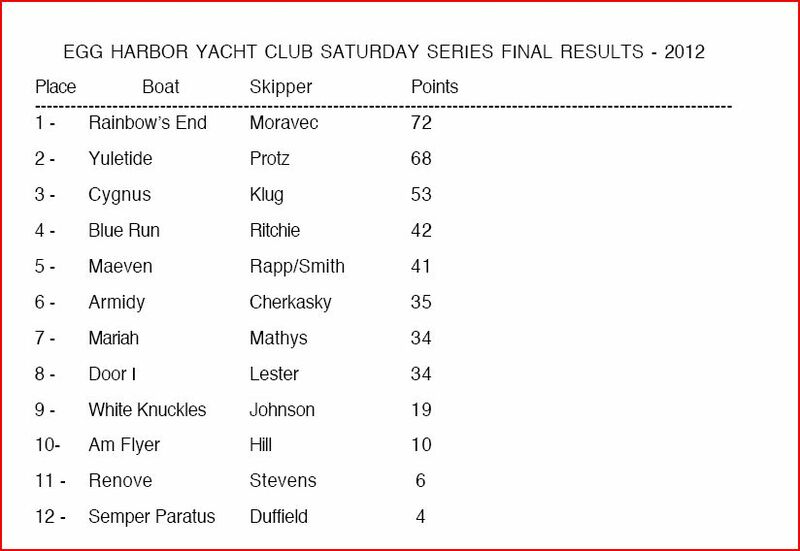 Saturday Sailing Series - 1st Place went to John & Marty Moravec (Rainbow's End), 2nd Place to John Protz (Yuletide), and 3rd Place to Karl & Lucy Klug (Cygnus). A nw trophy, named 'The Cygnus Cup,' was presented to John and Marty and the previous trophy was 'retired' and given to Karl and Lucy who had won 7 straight Saturday Sailing Series. A new award for the 'Fastest Average Time' was awarded to John Protz (Yuletide). Another new award, 'Yachtsman of the Year,' went to T. C. Johnson (White Knuckles) for the most improved sailor and for all he does for our club to improve the sailing community. We are looking forward to another fun-filled summer season in 2013!! On Saturday, July 21, 2012, the EHYC held its 2nd Annual Mary Poppins Umbrella Race and Third Saturday Gathering. It was a beautiful day; participants and spectators alike enjoyed the comaraderie and spirit of the race. Hopefully everyone will be able to attend our next scheduled event. Check out the 'Summer 2012 Events' tab above for details. Our Annual EHYC picnic was held on Sunday, September 2nd. It followed our Labor Day Family Fun Race. 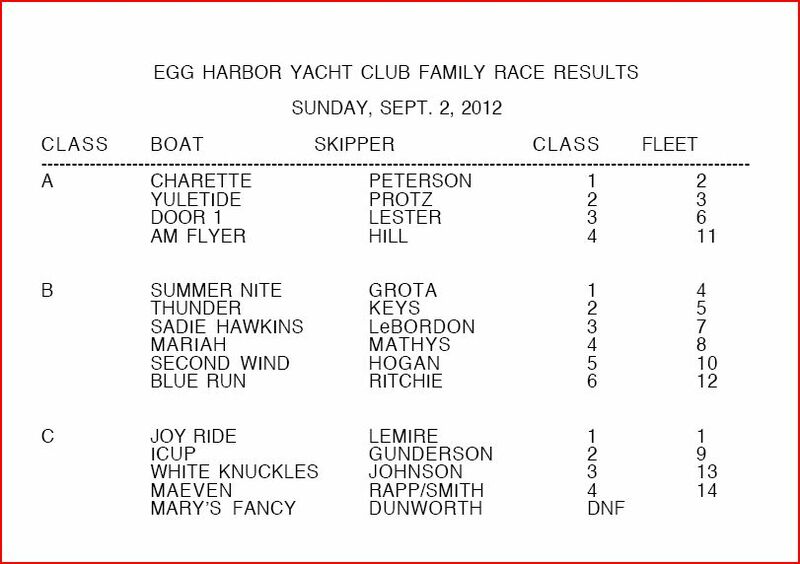 The Labor Day race results, as well as the Saturday Series final results can be found under the set of pictures to the right. We want to thank all the sailors from Marinette who were able to join in the day's activities. Congratualtions to JoyRide (Lemire) for being the overall winner! Thanks also go to Karl & Lucy Klug, Jerry Poquette, Jack & Sue Wittemore, Penny & Dan Niesen, and all those who helped make the afternoon such a success. annual Poker Run. Kayaks, dinghies, and even a Hobie Cat participated. Our Third Saturday Gathering followed. Members, friends, and family all enjoyed a beautiful afternoon at the marina. On Saturday, August 24, we held our very first Small Boat Regatta. 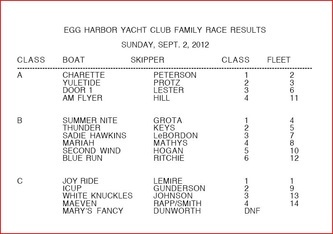 Light winds made for a long first race, then the winds picked up for the final two races. Both racers and spectators alike enjoyed a gorgeous afternoon. The three sets of pictures to the right and above are from the last two Saturday morning sail races, the Poker Run, the Small Boat Regatta, and our Labor Day Family Fun Race/Annual Picnic.